I’m not sure if I’ll ever make onion soup again, at least not as long as I live a 5 minute walk from Blue Ribbon Bakery and they still make their glorious version. For starters, chef and baker Sefton Stallard makes some of the best bread I’ve ever tasted and believe me I’ve tasted many a bread around the world! When creating the kitchen for Blue Ribbon Bakery he excavated an ancient wood fired brick oven in the cellar and called in an expert from Europe to restore it to working order. Seton studied in Paris at the Cordon Bleu and apprenticed in Paris and in Switzerland for several years. 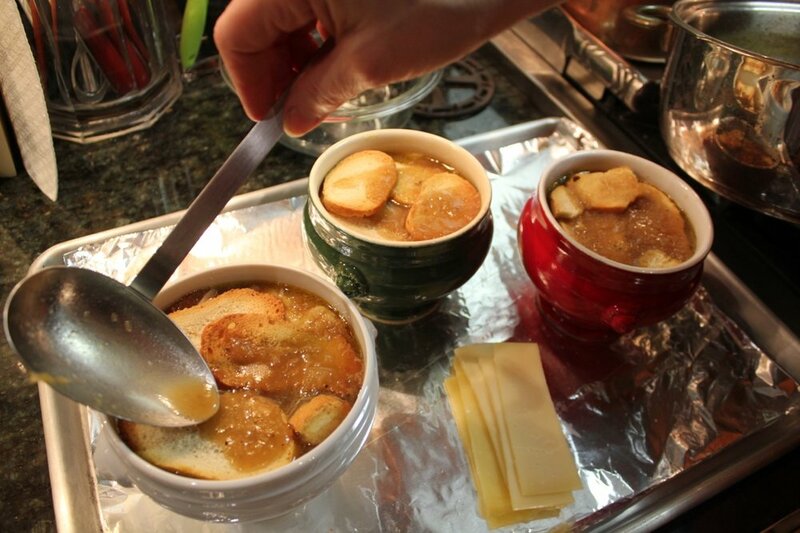 He created this onion soup based on his taste memory and, I suspect, improved on it as it’s better than any I tasted even in France. When cold weather sets in there is little more pleasing than this hot soup filled with caramelized onion and topped with a slice of bread soft and comforting with the juices of the stock, also serving to float an ample island of stretchy/stringy strands of melted gruyère with crunchy golden bits adhering to the edges of the bowl. It satisfies every possible longing--at least while eating it. 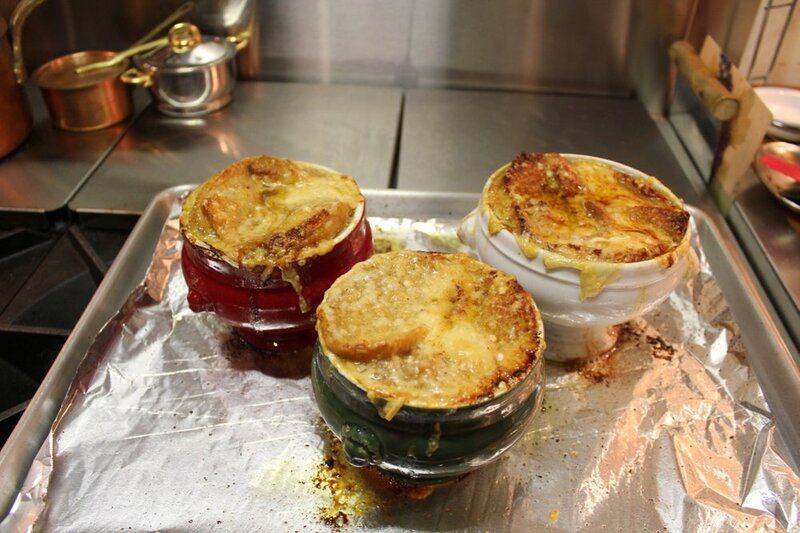 Another lovely memory I cherish of perfect French onion soup was in Tasmania when I attended a culinary symposium. The night before the conference the local culinarians prepared a welcome event and instead of serving fancy complex dishes they made a huge cauldron of this soup. It was the perfect solution for feeding a hungry crowd of food professionals and no one could have been happier. It also served to honor the Escoffier mantra: “Faites simple”! My translation: Make it simple but make it right. The main secret to great French onion soup is caramelizing the onions to a deep and flavorful brown in an ample amount of butter. A good quality stock adds to it’s depth of flavor, good bread as well and, of course, the gruyère should be the best you can find. (I get cave aged French gruyère from Murray’s cheese.) Slowly sautéed onions produce the best flavor and Sefton’s methods of caramelizing the onions takes 4 to 5 hours of frequent stirring (of course he's doing a large quantity) which is fine if you’re a chef and doing other things in the kitchen or have a kitchen slave. If not, I’m including a great shortcut that food writer Lora Brody came up with using a crock pot so that no tending of the onions is necessary and they come out perfectly caramelized as well. Drain and reserve the broth for the soup. Wrap the onions in plastic wrap and store in a freezer weight zip-seal bag for up to 2 weeks refrigerated, up to a year frozen. Caramelized Onion Soup (before I met Sefton) for one 1/2 cup caramelized onion, sliced 1/2 cup cooking liquid 1/2 cup broth salt and pepper 2-3 slices toasted baguette sliced and grated gruyère (1/8” thick slice + 1/4 cup grated) In a small saucepan, combine the onions, cooking liquid and broth and bring to a boil. Salt and pepper to taste. Ladle into an onion soup bowl. Top with toasted baguette. Sprinkle with the cheese and broil until bubbling and golden. 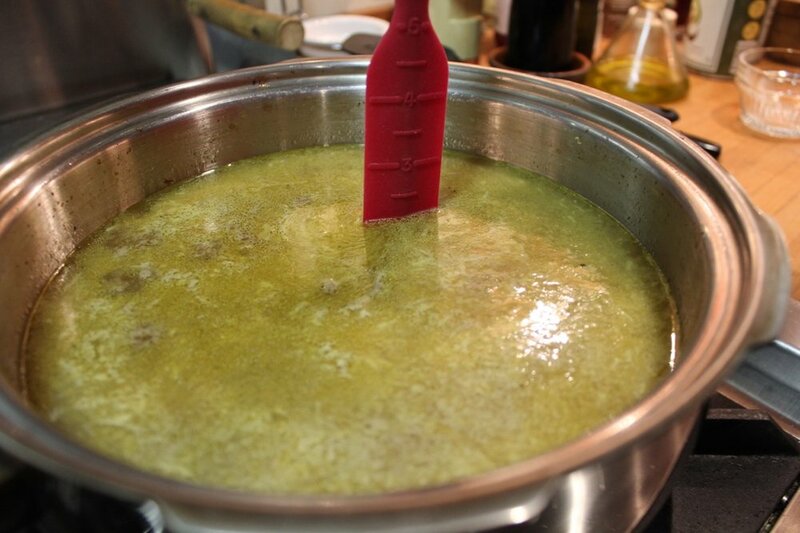 Caramelize the onions in butter, on low heat, stirring often for 1 hour or until deeply browned. Add the flour, stir well, and then add the white wine. Reduce it on low heat for about 10 minutes. 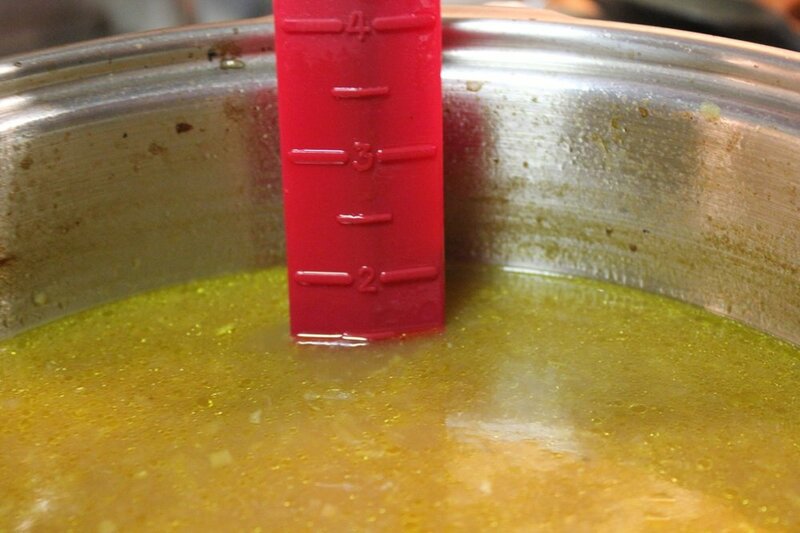 Add the stock and simmer partially covered for about 1 to 1-1/2 hours. Add the salt & pepper and adjust according to taste. Ladle into bowls, top with toasted bread slices, then with the cheese, and place in a preheated 400˚F/200˚C oven for 8 minutes. For a crunchy top place under the broiler for a few seconds—just until some of the cheese turns golden brown. This Recipe of the Month is an updated recipe from February 3, 2008 in Savory Cooking category on Our Blog page, which included the photo below. We have 50 plus postings for you to explore.